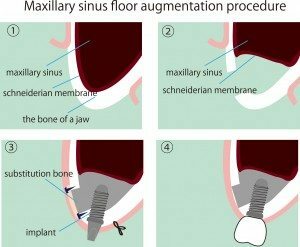 If you are getting dental implants, you may have to have a sinus lift. What is it and why is it necessary? Posted September 20, 2016 by admin & filed under Dental Implants, Diseases and Treatments, General Dentistry, Restorative Dentistry. 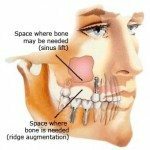 When discussing dental implants with your dentist, you may learn that you might have to have a sinus lift or bone augmentation. Let’s look at what that is and why it may be necessary. If you have lost upper teeth in the side or back of the mouth, particularly premolars and molars, you may have also experienced some loss of bone from your jaw. Periodontal (gum) disease can also contribute to bone loss. In some cases, the maxillary sinus, or open areas on each side of your nose, are too close to the jawbone. The size and shape of the sinus varies from patient to patient. Sometimes as we grow older, our sinuses grow larger and this can also contribute to bone loss. If you lose enough teeth and bone, your face may sag and show intense or premature aging. In order to have enough bone to anchor your dental implants, your dentist or periodontist must lift the sinus membrane and add bone to your jawbone. Your dentist or doctor will make a small incision in your upper gum where you are missing a tooth or teeth. The dentist will cut a small window into the lateral wall of the jawbone, move the sinus upward and then add bone grafting material into the bone. You should experience very little pain or discomfort during the procedure. Afterwards, you may experience some swelling and bruising. You may have to wait for a few months to heal and to allow the new bone material to strengthen before your dentist performs your dental implant surgery. However, in some patients, there is enough bone height to allow the dentist to do a minimally invasive bone or ridge augmentation at the same time that your dental implants are being added to replace lost or missing teeth.